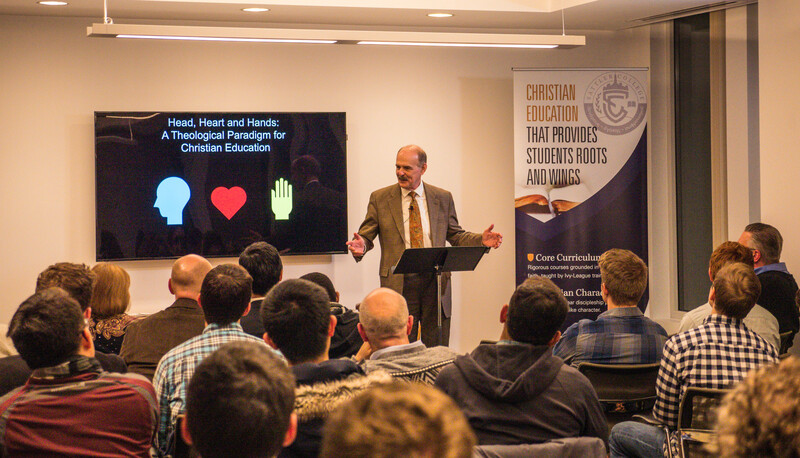 On February 28, Dennis P. Hollinger, president of Gordon-Conwell Theological Seminary, presented “Head, Heart, and Hands: A Theological Paradigm for Christian Education” to an evening gathering of Sattler students, along with interested local visitors and students from neighboring universities. Dr. Hollinger was guest speaker at the premier “Sattler Talks” event, an ongoing series of lectures given by leaders from around the world who are working to make a difference in our generation. 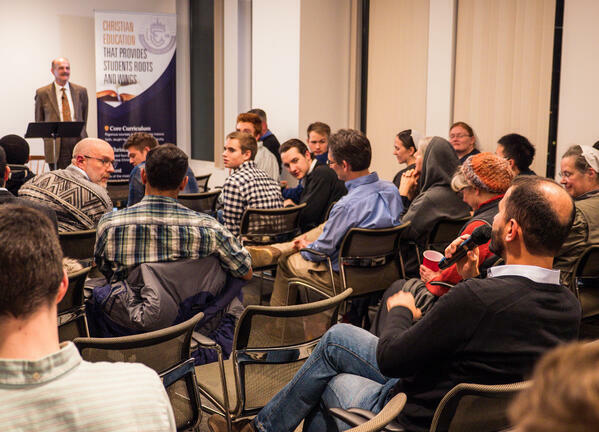 By engaging with cutting-edge topics and important public issues, Sattler students will be better equipped to make the greatest possible impact for Jesus’ kingdom. 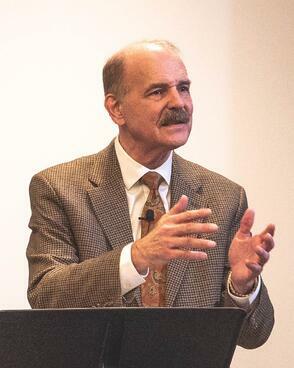 Dr. Hollinger’s message was based in his book Head, Heart, and Hands: Bringing Together Christian Thought, Passion, and Action, in which he maintains that the faith of churches, denominations, and individuals tends to focus on one of three primary categories: intellect, emotion, or action. To nurture a holistic faith, we need interaction between all three facets. Watch the video or read the synopsis below. For Christians and denominations who lodge their faith primarily in intellect, faith is about having correct theology. These people believe that if their thinking is right, every other part of life will fall into place. In this view, the intellect is the center of human personality, and their perspective could be summed up in Descartes’ statement: “I think, therefore I am.” Medieval scholasticism, Protestant scholasticism, liberalism, and fundamentalism are all examples of Christian movements based in intellect. Other Christian groups base their faith primarily in feelings, passion, affections, and deep spiritual experiences. To these people, God is intuited inwardly and a mature Christian will be guided by the immediate inner direction of the Holy Spirit. In this view, affection and emotion are key to the person, and their perspective could be summed up in the statement: “I feel, therefore I am.” Mysticism and Pietism, as well as the Charismatic/Pentecostal movement—the fastest growing Christian movement of today—serve as examples of Christianity based in the heart. Ministries of Proclamation, which focus on missions and evangelism. These people believe the most important thing a Christian can do is share the good news of Christ. William Carey, the father of modern missions, and D.L. Moody, the great revivalist, are excellent figureheads of this mindset. Ministries of Presence, which focus on redemptive action in society. The Anabaptists, the social gospel movement, liberation theology, and Francis of Assisi, who said, “Preach the gospel wherever you go; if necessary, use words,” are varying examples of people and movements which fit into this category. A vibrant and wholesome faith, Dr. Hollinger maintains, must integrate each of these components. Without a proper balance of intellect, emotion, and action, individuals and denominations will produce a faith that is distorted either by neglect or over-emphasis. We are created by God as holistic individuals, and each aspect of our beings—whether head, heart, or hands—feeds from and influences every other aspect. The Word of God teaches a faith that involves intellect, affection, and action. Modern fields of study corroborate this view of humans as holistic beings. Philosophy. Leading philosopher Michael Polanyi challenged pure scientific objectivism and suggested that our worldview often predisposes us to interpret evidence in a certain way. Major discoveries have come, not from pure research as we might think, but from imagination-fueled ideas which were tested out. Education theory. Heinrich Pestalozzi taught that education should not only feed the mind, but also the heart. In addition, we learn best by acting and doing. Howard Gardner has popularized the idea of multiple kinds of intelligence, categorizing eight different types. He suggests that intuitive intelligences move beyond a pure rational approach. We live in a fragmented world where people no longer reason the way they did in the 20th century. Therefore, the greatest apologetic for the 21st century is holistic, not purely rational. Jesus and his followers lived the gospel which they proclaimed. The people of our day also need to see a holistic Christianity which touches every aspect of our lives. Dennis P. Hollinger is the President of Gordon-Conwell Theological Seminary in South Hamilton and the author of Head, Heart, and Hands: A Theological Paradigm for Christian Education. He has also written several other books which explore many of today’s most difficult ethical issues with Biblical steadfastness and compassion. Dr. Hollinger previously served as President of Evangelical Theological Seminary in Myerstown, Pennsylvania, and as pastor of Washington Community Fellowship on Capitol Hill in Washington, D.C. For his full bio, visit the Gordon-Conwell Theological Seminary website. Having a speaker on campus is not an endorsement of his views or opinions and by no means signals agreement or alignment with the speaker in general or on any specific issue addressed. Should a speaker ever espouse views or opinions in direct contradiction to our stated Founding Precepts, we would of course address this with our students in an appropriate venue.